The Most useful and unique wedding gift ideas for the newlyweds! Are you searching for some unique, practical and useful wedding gift ideas which will make the happy couple even happier? Gifting the couple something useful is very important! You dont want your friend’s home to be flooded with Ganesh murtis, showpieces or silver coins only. Well don’t worry because we've compiled a list of some thoughtful and creative wedding gifts ideas with some insights from the real brides themselves! 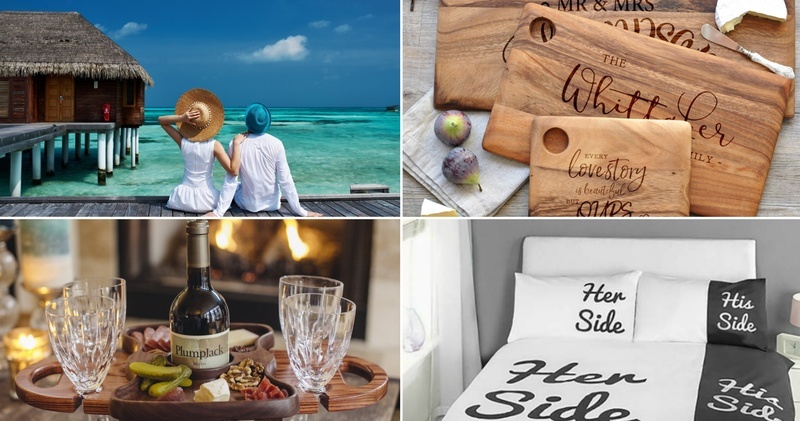 Scroll on to discover some really creative, personalised and unique wedding gift ideas in every price range for the bride and groom! Spruce up the just-married couple’s everyday plates with some splashes of color to brighten up their kitchen. Go beyond a regular picture frame with these modern, minimal and digital photo frames. Isn’t it a really cute wedding gift idea, what say? You can get it, here. A set of luggage trolleys is one of the best wedding gifts for the newly married couple. Plus, they'll think of you every time they're packing for their trip :D ! For an added touch, you can also get some custom luggage tags with their names and their "I Do" date. This might seem a bit on the pricier side of wedding gifts of course, but it's definitely something that the bride and groom will appreciate. What you can also do is that, you can round up a group of friends to go in on this present together. How about a mini-moon voucher as a wedding gift to the just-married couple? It’ll be one of the most unique wedding gifts they’ll receive(and duly love)! Whether they're cheese connoisseurs or meat mavens, this wood board can showcase all their favorite nibbles during the parties or even on the quiet nights in! Customize the platter with their monograms or their last initials on it. Give the gift of adventure with a gift card, and what’s more is that the couple can pick their own adventure - a nearby cabin or a loft in the heart of a big city. This one is our favourite wedding gift idea for the newly weds! New pots and pans are another kitchen staple that the bride and groom will be thankful to have. Here's to the many, many meals they'll prepare together! What better way to unwind after the whirlwind of planning and stress than to with a few good books? This is a great fit for the literary, bookworm-y couple though! Treat the newlyweds with a new set of cozy sheets as their wedding gift. Also, you can't go wrong with a neutral color and soft linen. Here's to many good sleeps in their future. A set of fresh towels with matching bathrobes and bath mats? Ain’t nobody will say no to that! You can also take it up a notch by getting the robes monogrammed. This is another purely practical choice, but a great idea nonetheless. A clean house goes a long way in keeping stress at bay! Also, the couple will be extremely appreciative of a spotless home that they can simply enjoy. Give the newly married Mr. and Mrs. for a day to relax and rejuvenate at the spa and they won’t be able to thank you enough for it. This one is for coffee connoisseurs. There is nothing quite like starting off the morning with coffee freshly made in a French press. Although, just make sure they don’t already have one before finalising on this one as their wedding gift! A unique wedding gift that steps above the regular bottle of wine, is this one-of-a kind wine caddy. This genius invention ensures that their wine-drinking necessities are always grouped together for instant consumption, while also looking aesthetically pleasing. One can truly never have enough drink coasters, especially if they're a frequent party host. Kick the newlywed's coffee table up a notch with this uber cool wine coasters as their wedding gift. Whether it's a sports game, a comedy show or a musical, the couple surely has a favorite. Just make sure to pick the right one and your wedding gift will surely stand out above all the others! Well, because you can never really go wrong with food. Also, it’s something totally different from all the mithais that their house will be flooding with. #DesiWeddingThings. We got coffee and wine covered, but hey what about the green tea and chai lovers in the house? This one is for them! Okay, so let's not forget about cold, hard cash with the list coming to an end! This wedding gift idea might not be on the creative side, but will be duly appreciated! You can never really go wrong with it! Although, to make it more personal, you can write a thoughtful and sincere card to go along with this practical gift! With our list coming to an end, we are pretty sure you have the perfect wedding gift idea for your BFF getting married!